Subway are now legally obliged to measure their sandwiches, after losing a lawsuit in the US 10 people who sued when their "footlong" subs were less than 12 inches long. Good news, sandwich and ruler fans, Subway are now legally required to make sure their footlong sandwiches are a foot long, and their six inchers are (surprise surprise) six inch. The sandwich chain had to pay out $520,000 in legal fees and $500 to ten customers who decided to sue them after the "footlongs" they purchased in New York were all 0.5-1 inch short of a full 12 inches. 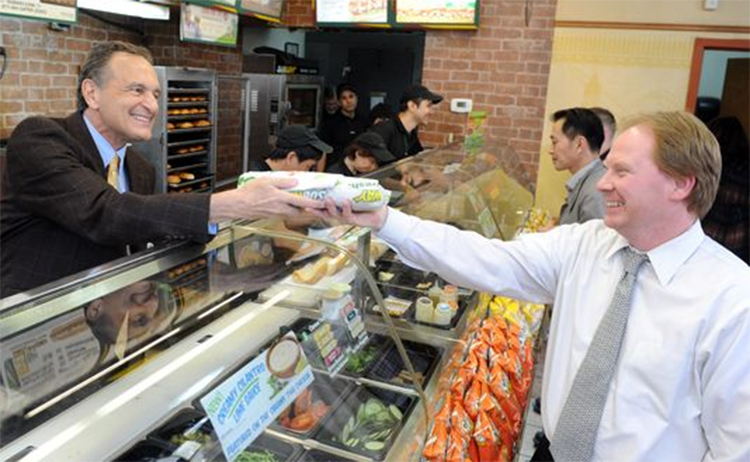 As part of the settlement with the claimants, Subway agreed that for the next four years all their sandwiches will be at least the size they promised, or larger. "Woah there, motherf*cker. Hold your horses. You measure that meatball marinara right this second. It's the law, now. Don't make me call the police." “It was difficult to prove monetary damages, because everybody ate the evidence,” Thomas Zimmerman, a lawyer for the plaintiffs, said of the court case, likely to live on in people's memories even more than the Steven Avery case. “This allows us to move forward, without distractions, on our goal to provide great tasting sandwiches and salads, made exactly as each guest likes. We have already taken steps to ensure each guest receives the Footlong or six-inch sandwich they order,” the statement said. Lynn Adelman, the judge in the case, told the claimants lawyers in mediation that their claims “were quite weak”. The judge recommended that instead of monetary damages, the plaintiffs should focus instead on getting Subway to ensure their sandwiches stand up to size checks in future. Like heroes from a Tolkein book, they accepted this quest and won. "While the [sandwiches may be] different shapes, they still has the same quantity of ingredients", Judge Adelman wrote. "The amount of meat and cheese is also standardised, but it’s possible that a shorter bread loaf might lead to a slightly less toppings. [...] A sandwich that was ¼-inch shorter than advertised might be missing a few shreds of lettuce or a gram or two of mayonnaise." The judge also accepted that sandwiches are made in front of the customer, and the customer can ask for more toppings if they feel short-changed. “Thus, the plaintiffs learned that, as a practical matter, the length of the bread does not affect the quantity of food the customer receives,” Adelman wrote. Subway have agreed to require franchises to use "a tool for measuring bread" for the next four years. Or, you know, "a ruler". They will be doing this in the UK as well, as there is a potential for the same kind of lawsuit over here. Subway could have avoided this legal mess if they'd just labelled their sandwiches "big" and "small"